“With most of my classes, whether it’s teaching in a classroom, in the pedagogy lab, or out in the community, I try to bring a real-world practice into the class. I try to make it as personal as possible and encourage that with my students and even bring my own experiences into the classroom. Many of the teachers here now were here when I was a student and have instilled in me the ‘pay if forward’ approach to teaching – what can I improve on each day and how can I explain to my students why it is so important to improve." MINOT, N.D. – Minot State University instructor Troy Roness was recently named the North Dakota Society for Health and Physical Educators (NDSHAPE) College and University Physical Education Teacher of the Year, the organization announced. Roness will be presented the award at the organization’s state conference Sept. 24 in Bismarck. NDSHAPE was established in 1928 to encourage and provide professional development and support for Health, Physical Education, Recreation, and Dance (HPERD) professionals. The group is made up of public and private school teachers, collegiate professors, and health professionals that believe in the importance of active living. The award was voted on by Roness’s peers. “First off, it was completely unexpected. I had no idea that I was even nominated and never in a million yeas did I expect to be nominated, let alone win. But I’ve been thinking about it since I learned I won and I can say that it has really motivated me to do more and to be better in every sense of the word. I want to work that much harder with my students and it reinforces my passion for teaching,” Roness said. Roness holds a Bachelor of Science Education in Health and Physical Education and earned his master’s in education and cognitive science from Minot State. He also holds a master’s degree in counseling and student affairs from Minnesota State University, Moorhead. He credits his fellow professors at Minot State – many who were teaching while he was studying for his degrees – and the strong MSU education program in setting him up for this prestigious award. 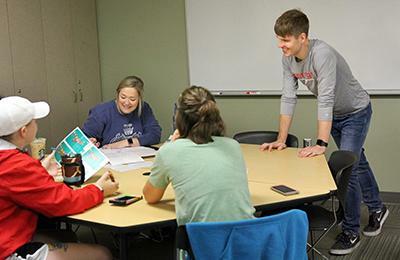 “With most of my classes, whether it’s teaching in a classroom, in the pedagogy lab, or out in the community, I try to bring a real-world practice into the class,” Roness said. “I try to make it as personal as possible and encourage that with my students and even bring my own experiences into the classroom. Many of the teachers here now were here when I was a student and have instilled in me the ‘pay if forward’ approach to teaching – what can I improve on each day and how can I explain to my students why it is so important to improve.